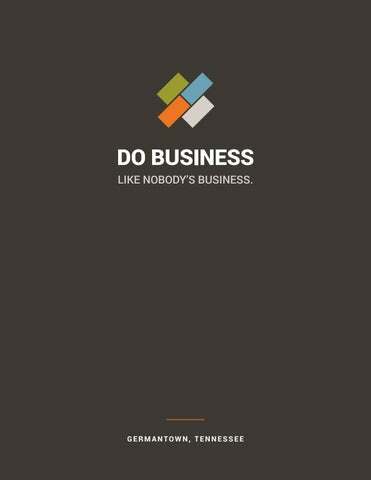 DO BUSINESS LIKE NOBODY’S BUSINESS. 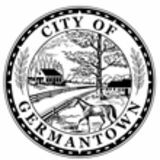 Dear friends, Thank you for considering the City of Germantown for your business. Whether you’re relocating or expanding, whether you’re a start-up or a Fortune 500 company, we welcome you. Germantown is an ideal place for growth. We have a thriving business climate. A supportive government. Extraordinary quality of life. And we’re proud to be one of the top three safest cities in Tennessee, year after year. You’ll find plenty of facts and statistics in this book that confirm all these points. But as you continue to research and explore the City, and spend time here, you won’t need proof that our City is exceptional. You’ll experience it firsthand. Welcome to Germantown. Here’s to your success. YOU’RE READY TO GROW. Why should you do it in Germantown? Because it’s the ideal environment for your business to thrive. Because the City will support you. And because, honestly? Germantown’s just a great place to live. So, let’s get down to business. SUCCEED IN A PROSPEROUS BUSINESS CLIMATE. Global corporations. Luxury retailers. Boutique shops. Leading edge healthcare. Acclaimed restaurants. They all flourish here. So no matter who you are or what you do, you’ll be in good company. FLEXIBILITY, FAST-TRACKED. Our SmartCode zoning for mixeduse developments opens up endless possibilities for land use. And developments in SmartCode districts enjoy a streamlined approval process. of residents 25+ have high school diplomas. LOGISTICALLY SPEAKING… •	Memphis International Airport is the second-busiest cargo airport in the world. •	The International Port of Memphis: -	second-busiest port on the Mississippi River -	fourth-busiest inland port in the U.S. -	largest stillwater harbor on the Mississippi River -	ice-free year-round •	Third largest rail center in the U.S.
WORK WITH A GOVERNMENT THAT’S HEALTHY — AND HELPFUL. Here’s a game-changer: Germantown is all about clear-cut, straight-forward processes. Easy-to-access information. And people and processes that help you succeed. Isn’t it nice to see a business-friendly face? MONITOR SUCCESS WITH CONTINUED AND EXPANDED MEASURES OF PERFORMANCE. We believe in continuous improvement. That means constantly taking our City’s economic pulse. Tracking progress. Abiding by our business plan. And thinking ahead. REPOSITION GERMANTOWN WITHIN THE REGIONAL ECONOMY. The word is out: we have a lot to offer. High quality of life, an educated workforce and state-of-the-art healthcare to name a few. These assets are attracting new businesses like yours, making our City healthier — literally and figuratively. CREATE AN ENABLING ENVIRONMENT. We give your business clear processes. So you can start, locate and grow in an environment of certainty and predictability. 2 LEVERAGE ASSETS TO ATTRACT NEW INVESTMENT. We’ve invested in infrastructure, amenities and City facilities to clear the way for you to set up — and succeed — here. 3 BUILD VALUE FROM WITHIN. Our existing businesses are some of our most valuable assets. So once you’re here, we’ll support you with infrastructure, assistance, processes and guidelines that keep you strong. Our Board of Mayor and Aldermen (BMA) sets City policies. ALL YOUR RESOURCES IN ONE PLACE. Need to know where to go to register your business? Get a certificate of occupancy? Or find out about regulations for signage or renovations? Go to GermantownEDP.com/Resources for all that and more. PILOT and TIF programs available for qualifying businesses. ENJOY EXCEPTIONAL QUALITY OF LIFE. Want an energized, productive workforce? It starts outside the workplace. With miles of biking and running trails. City parks for days. Access to the arts, public festivals and excellent healthcare. And safety and security. Guess what? Youâ&#x20AC;&#x2122;ll find all that and more, right here. When it comes to planning for the future, we mean business. Recently, 30 residents partnered with City leadership and local experts. They spent a year planning for a sustainable social, environmental and economic future for Germantown. Want the details? Visit Germantown-TN.gov/2030. CONVINCED? We hope so. Call us. Send us an email. Or just drop by. Letâ&#x20AC;&#x2122;s take care of business. GERMANTOWN DEPARTMENT OF ECONOMIC AND COMMUNITY DEVELOPMENT 1920 S. GERMANTOWN ROAD | GERMANTOWN, TN 38138 901.757.7281 | GERMANTOWNEDP.COM Â©2016 GERMANTOWN DEPARTMENT OF ECONOMIC AND COMMUNITY DEVELOPMENT. ALL RIGHTS RESERVED. Get the latest news about Economic Development in Germantown and find out how you can do business, like nobody's business.